Yesterday I finally got to try out the handmade virtual pinball machine created by my buddy Spuds that he calls "iPin3K". It's ridiculously cool. From afar it looks like your standard (if a bit wide) pinball machine, complete with flippers, a ball shooter, and flashing lights. Which is already so cool to have in your home. Only on closer inspection do you realize that the entire game is simulated, created with three different different computer monitors and a homebrew Windows PC running pinball emulation software. Despite this, the games felt totally real and convincing, from the "clack clack" of the flippers to blur of the ball whizzing around the board to the cheesy voice-overs from Arnold Swartzanegger and Patrick Stewart. Spuds spent the past four months building the cabinet, assembling the computer components, installing the 3 monitors, connecting the buttons, flippers and ball shooter, and troubleshooting the software. It's already really impressive and Spuds tells me he's about "halfway there." Apparently he still needs to add lights, physical feedback for the bumpers, and other physical electronics. The video above shows me blowing away Spuds' high score on the classic game Abra Ca Dabra. Which just means he hasn't played it very much. 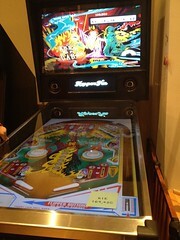 After all, he's got 50+ other pinball games loaded up on his virtual machine! I'm totally blown away… and can't wait to come back and play some more!